Most electronics companies are always trying to make everything smaller and smaller. At SparkFun we do that, but we also like to make super sized teaching tools. This tutorial shows you how to make a gigantic soldering iron. 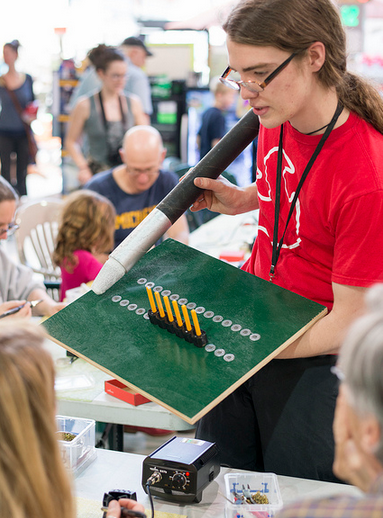 This giant soldering iron is a great teaching tool for all ages. We use it to teach a large number of people PTH and SMD soldering because it’s hard to demonstrate technique to a bunch of people with an itty bitty soldering iron.